Disney on Ice Presents: Follow Your Heart! Eagle Bank Arena October 19-23, 2016!! Frozen and other beloved Disney stories visits EagleBank Arena in Fairfax, VA on October 19 – 23, for 9 performances. Tickets are on sale now. Disney’s Frozen and learn love is the most powerful magic of all. Toy Story gang. 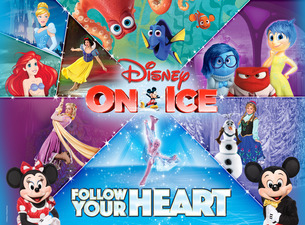 Make unforgettable memories with Mickey, Minnie and all your Disney friends when Disney On Ice presents Follow Your Heart skates into Fairfax, VA! Disney On Ice production will excite and amaze fans of all ages. by calling Ticketmaster outlets, by phone at 800-745-3000, via www.ticketmaster.com, and the EagleBank Arena box office. For group rates and information, contact 202-661-5061.